This week I got a few books from Charlesbridge Publishing! Every Bone Tells a Story: Hominin Discoveries, Deductions, and Debates by Jill Rubalcaba and Peter Robertshaw. February 2010. From jacket flap: Contrary to the brash images of tomb-raiding adventurers that Hollywood often creates, today's archaeologists are actually cutting-edge scientists. Their buried treasures are the remains of our hominin ancestors. Archaeologists and other scientists examine the evidence from each discovery in their laboratories, seeking answers about our history - clues that could offer insight into human behavior and culture. Every discovery adds a piece to the larger puzzle of our past, but sometimes the scientists disagree over how, or even if, the pieces fit together. Jill Rubalcaba and Peter Robertshaw offer an engaging account of the discovery of four hominins - Turkana Boy, Lapedo Child, Kennewick Man, and Iceman - as well as the laboratory deductions that scientists made in learning more about them, and the controversial, often heated, debates that ensued over the scientists' differences of opinions. I'm a science girl and this one sounds similar to Lucy Long Ago and parts of Secrets of a Civil War Submarine, both of which I loved. 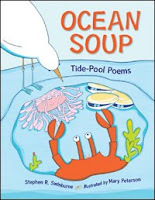 Ocean Soup: Tide-Pool Poems by Stephen R. Swinburne, illustrated by Mary Peterson. February 2010. From jacket flap: From the low-down dirty lobster to the old, cold fish living under the pier, playful poems introduce some of the squishy, shelled, and spiny creatures that call the Atlantic and Pacific tide pools home. This one looks very cute and will tie in well to the collaborative summer reading program that many libraries are doing this summer. Older Than the Stars by Karen C. Fox, illustrated by Nancy Davis. February 2010. From the jacket: How old are you? Older than you think. The iron in your blood may have once been part of a volcano... the calcium in your bones may have been part of an ancient oyster shell... the oxygen in your lungs was once probably breathed by dinosaurs... and every little bit of you was once part of a star. In a way, you are as old as the universe itself. A picture book about the Big Bang Theory. 'Nuff said. That's it for my mailbox; did you get anything awesome in your mailbox this week? So looking forward to reading Older Than the Stars. It looks amazing. Oh Every Bone looks good :) HAppy Reading! Wow! What a great week--every book sounds good. I'm especially intrigued by the Big Bang book; looks gorgeous. All three of these sound wonderful. We're studying prehistory and evolution right now so Older Than the Stars and Every Bone would fit in perfectly and my girls both love tidepool creatures.